How can I restrict managers' view of the schedule to their own location(s)? 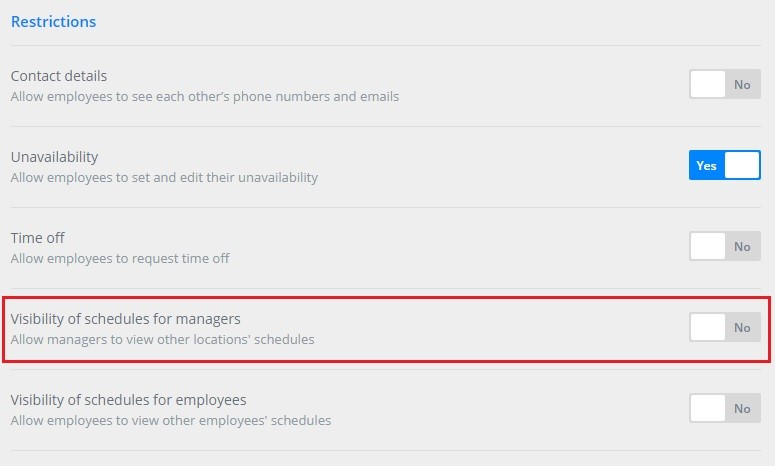 By default, managers are able to see schedules for all locations, but Premium subscribers have the option to restrict their managers' view of the schedule to just those assigned within a manager's profile. To change this setting, go to Dashboard > Settings > Company Settings. Scroll to the Restrictions section and you will see the option. Switch the toggle to No and your managers will only be able to view schedules for locations assigned in their profiles.